Sign-Up for an evening Book Club reading: Strings Attached, Run by the Author – Judy Blundell! Ages 12 and up. Judy Blundell, a National Book Award winner for What I Saw and How I Lied, will be at Little Joe’s Books in Katonah on Thursday, October 18th at 7pm! She will be leading a book club discussion for kids 12 and over, on her latest novel Strings Attached. We have been fortunate to have authors lead book club meetings before and it is an extraordinary opportunity for young readers to discuss and analyze a book and the writing process with the creator! Registration is required for this event and you must purchase Strings Attached at Little Joe’s Books. ($9.99) However the pizza, drinks, dessert and time with Judy Blundell are free (and time with Judy is priceless!) Come in now to get the book and start reading! Here’s a description of Strings Attached: “From National Book Award winner Judy Blundell, the tale of a sixteen-year-old girl caught in a mix of love, mystery, Broadway glamour, and Mob retribution in 1950 New York. When Kit Corrigan arrives in New York City, she doesn’t have much. She’s fled from her family in Providence, Rhode Island, and she’s broken off her tempestuous relationship with a boy named Billy, who’s enlisted in the army. The city doesn’t exactly welcome her with open arms. She gets a bit part as a chorus girl in a Broadway show, but she knows that’s not going to last very long. She needs help – and then it comes, from an unexpected source. Nate Benedict is Billy’s father. He’s also a lawyer involved in the mob. He makes Kit a deal – he’ll give her an apartment and introduce her to a new crowd. All she has to do is keep him informed about Billy…and maybe do him a favor every now and then.” – Goodreads. Sounds great, right?! Sign up, get the book and start reading! Judy will be here Thursday, October 18, from 7 – 8:30pm. Great books, kids and authors together…a magical combination! 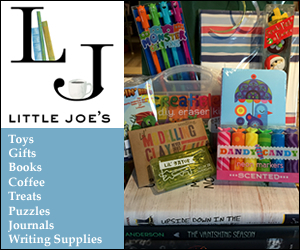 Little Joe’s Books, 25 Katonah Avenue, Katonah, NY 10536, 914-232-7278. Open 7 Days A Week. Visit www.littlejoesbooks.com.